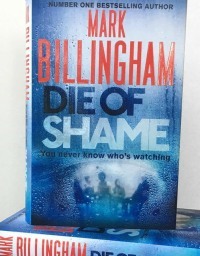 The latest Mark Billingham standalone novel does, like the earlier ones, get his books' usual protagonist Tom Thorne to make a cameo appearance, but introduces a new DI, Nicola Tanner, to actually investigate this crime. This might be because it's a bit of a format-breaker, but then again one thing I like about Billingham as a crime writer is that he never really has a set format anyway. Die of Shame is centred around a counseling group for addicts - a variety of addictions, from drugs to alcohol to overeating, with an equally disparate collection of people. When one of them is murdered, Tanner is convinced the killer comes from within the group. The book isn't really built around her investigation though, it mainly focuses on the group, alternating between flashbacks to before the murder and their reactions to it afterwards. I liked the format a lot, although the solution to the crime is based on information we get very late in the day. And it's a bit unfortunate that, having introduced a lesbian detective, Billingham then has her fail to solve the crime, the implication being that Thorne comes in at the end and handles it (the reader still gets to find out whodunnit of course, through one of the flashbacks.) I think this story crosses over with the next Thorne novel, which will probably be the better for having that background, but Die of Shame itself is one I enjoyed with some reservations.